With hundreds of merchant ship shots taken over the years, this page shows only a small number of examples from my collection. I now intend to cover individual vessels with their own entries as they are photographed. 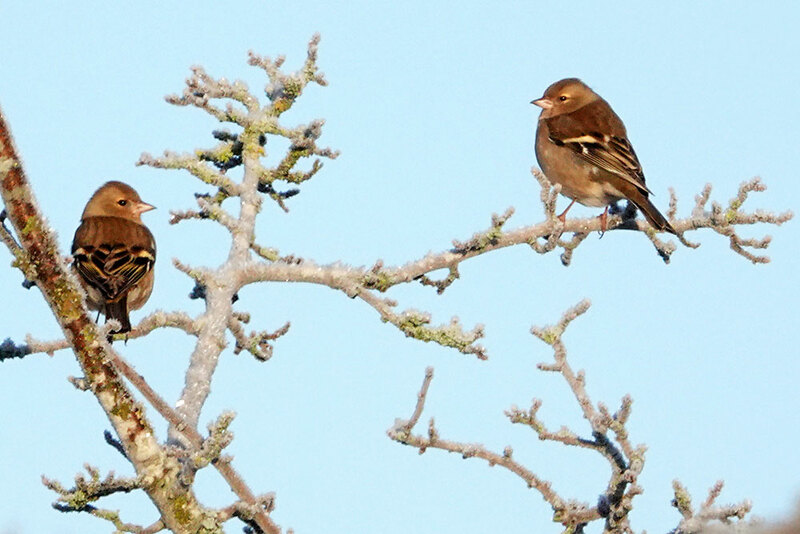 Meantime, I`ll try and work back and add a few images when time permits with the most recent first. Bulk Carriers and Containerships are listed separately. 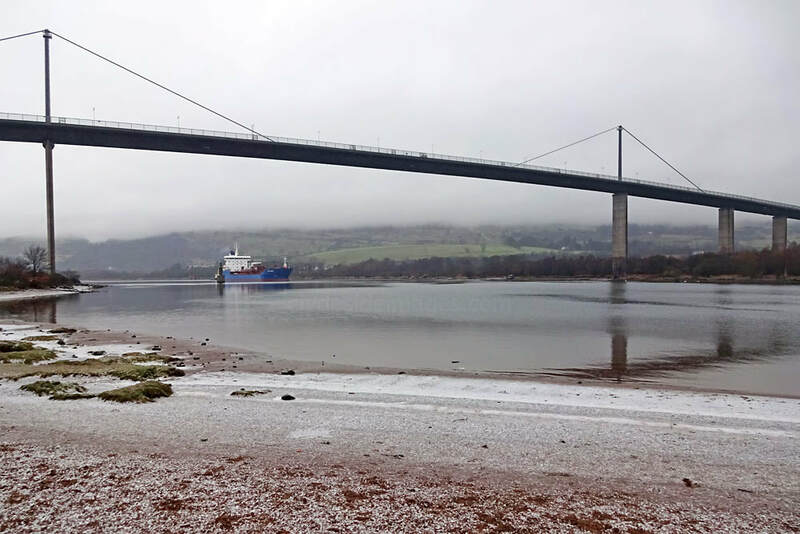 Sunday 3 February: Sleety showers had just turned to light rain when I went down to Erskine harbour to catch the Danish-flagged tanker Bro Nordby on her way to the Clydebank Oil Terminal. Recent snowfall had left a patchy covering of iced-up slush here, making the short trail from the car park to the beach very slippy underfoot. 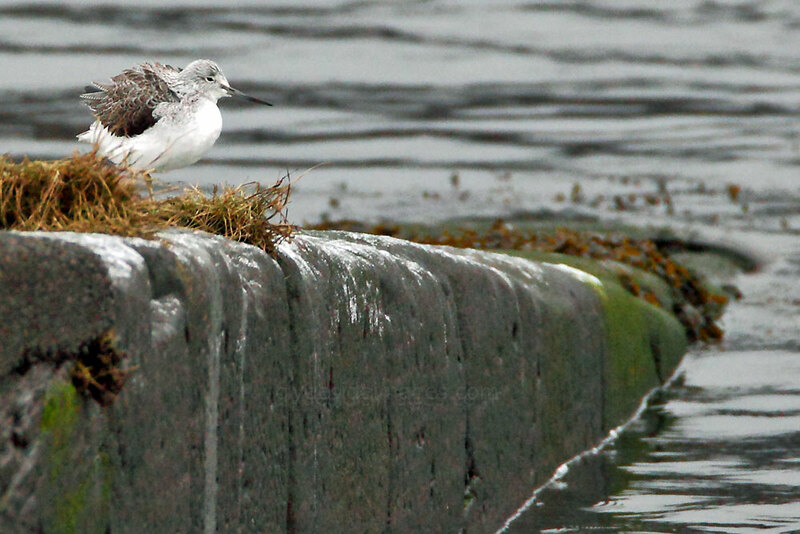 Some Oystercatcher and a few Lapwing were roosting on the old Erskine ferry slipway as was a single Greenshank (see below left). Once the tanker sailed out of view I took a few distant shots of the birds and that`s when Afalina (IMO 8820092) made a surprise appearance, heading downriver bound for Vasteras, Sweden. 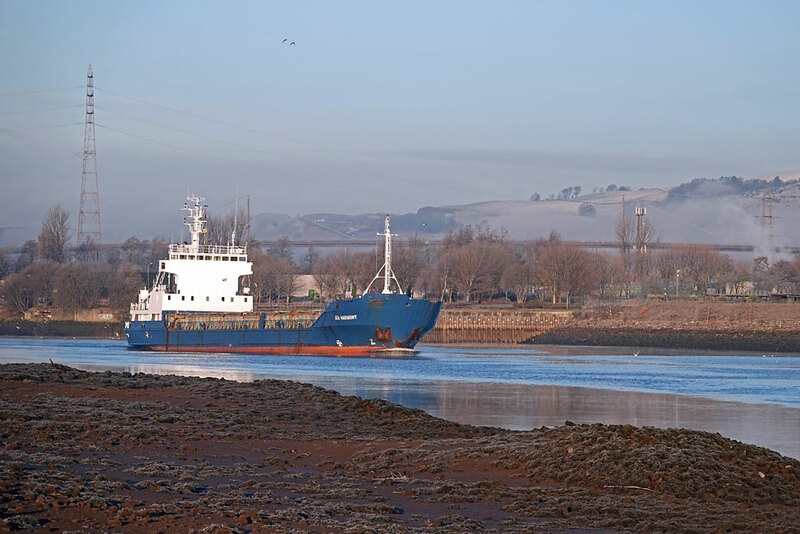 She had arrived at Glasgow from Warrenpoint, Northern Ireland, the previous day and I was unaware that she had left the KGV Dock around the same time the tanker was due. This vessel dates from 1989 having been built in Hamburg, Germany by JJ Sietas Schiffswerft. She is owned and managed by Afalita Shipmanagement, Klaipeda, Luthuania and flies under that country`s flag. She originally sailed as Aila, a name she kept until receiving her current identity in August 2005. 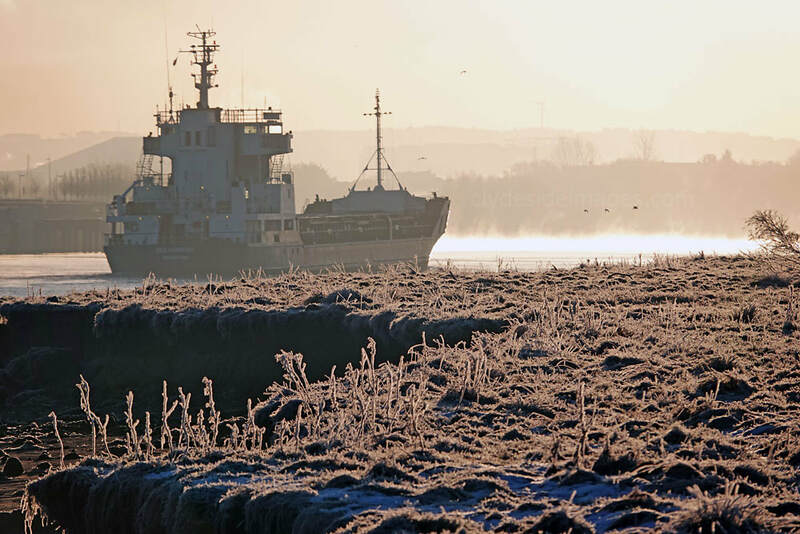 At just a fraction under 105 metres in length, she has a gross tonnage of 3,826 tons (DWT 4535 tons). 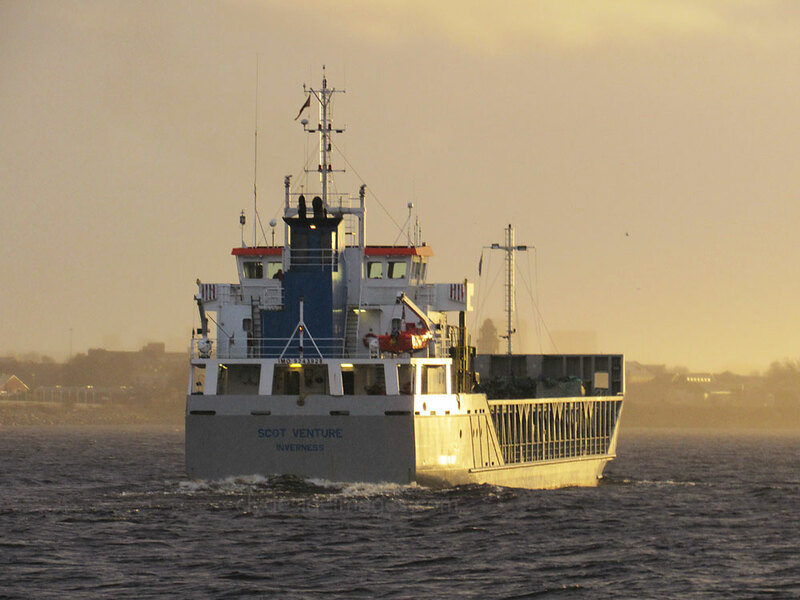 Bro Nordby ​​​(IMO 9322712) is no stranger to the Clyde, having made numerous visits to both Rothesay Dock and the Finnart Oil Terminal on Loch Long. There are several vessels named Sea Harmony, but this one (IMO: 8914166) was built by ENVC, Viana Do Castelo, Portugal, in 1991. She`s owned by UK based Saturn Shipping but registered in Bridgetown, Barbados, and has a Gross Tonnage of 2,481 tons (DWT 2,900 tons). She was originally the Wannsee, a name she kept only until February 1992 when she became Medeur Terzo. Further identity changes during her career included Zelo, Intermodal Malta, MF Malta, Nordstrand and Graf UKO. 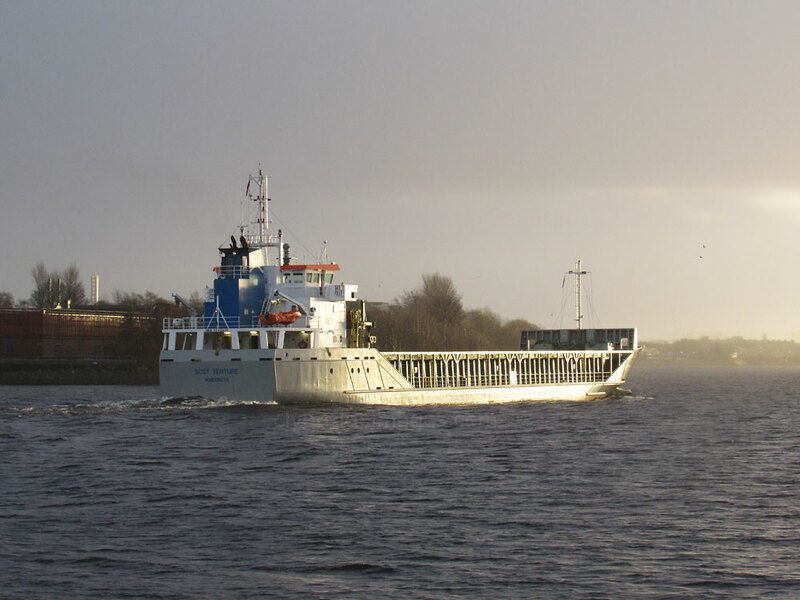 Sea Harmony was carrying woodchips from Ireland on this occasion and made her way upriver to Glasgow early on Wednesday 23 January. 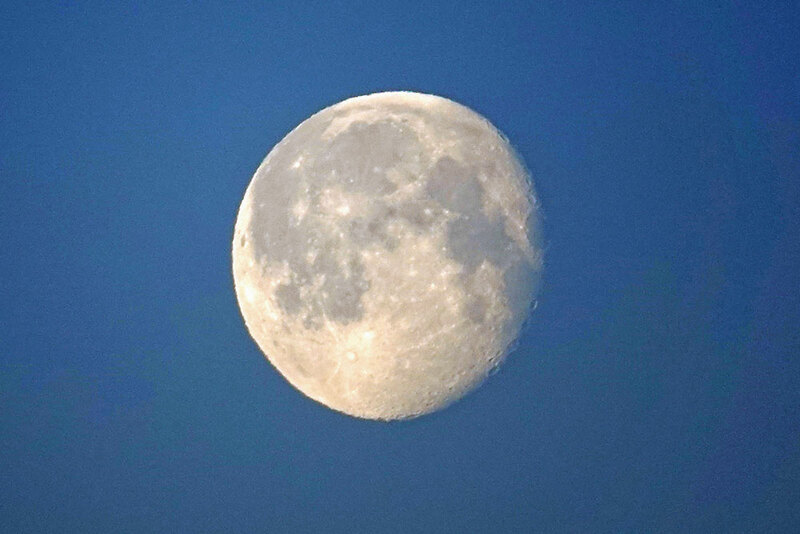 It was a superb morning following one of the coldest nights of the winter so far and the full moon was still clear in the sky. 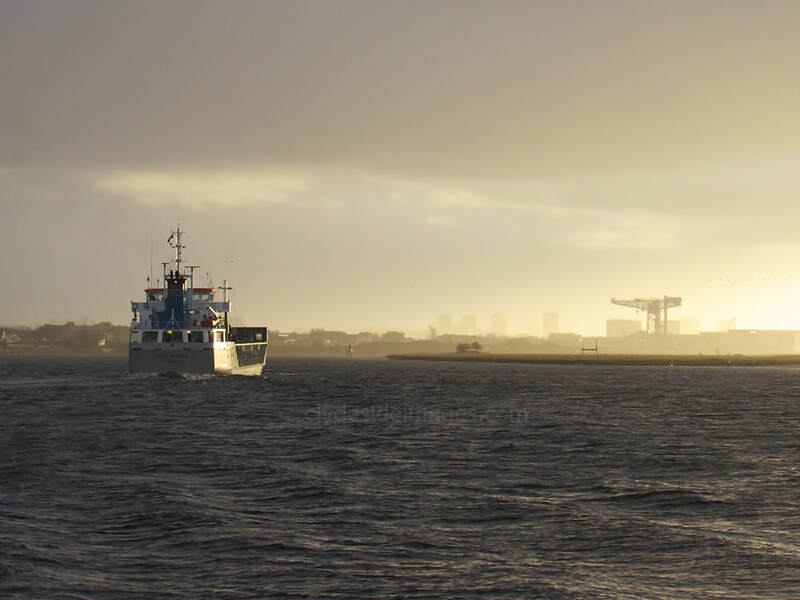 I opted to catch the ship as she passed the Titan Crane which acts as a permanent memorial to the old John Brown`s Shipyard site and the men who worked not only there, but at the various yards and associated industries all along the Clyde. Built in 1907, the 150 foot high structure was the world`s first electrically powered cantilever crane and was used for lifting heavy engineering parts such as boilers and gun mountings. Over the course of the Great War John Brown`s built a total of 47 warships as well as numerous merchant vessels and tanks. The yard also made a significant contribution to ultimate victory in WW2 and went on to produce some of the world`s most iconic ocean liners. The Newshot Island reed bed from the east. 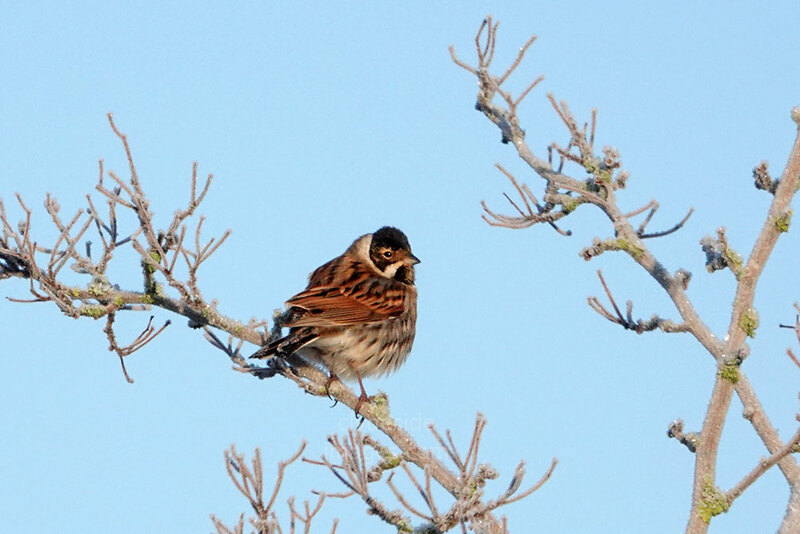 Goldfinch, Chaffinch and Reed Bunting were flitting among the branches of the trees that border the south side of the reed bed and I`d inadvertently flushed half-a-dozen Snipe that were sheltering in the long grass close to the riverbank, just before Sea Harmony arrived. 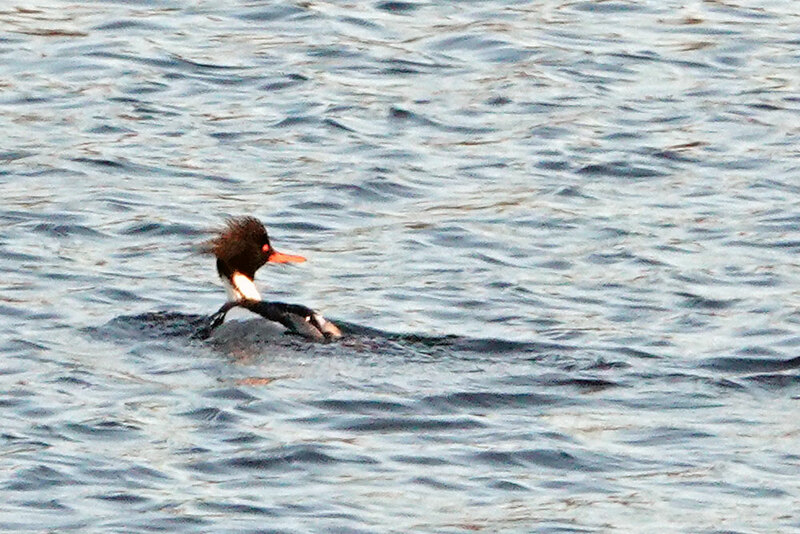 On the Clyde itself were mainly Mallard, Wigeon and a few Goosander. Lapwing, assorted gulls and the occasional individual Cormorant were airborne, the latter re-positioning further downstream. ​Another panorama shot taken from the same spot as the one above. This view shows the Golden Jubilee Hospital at Dalmuir on the left and the distinctive clock tower of Clydebank Town Hall on the right. 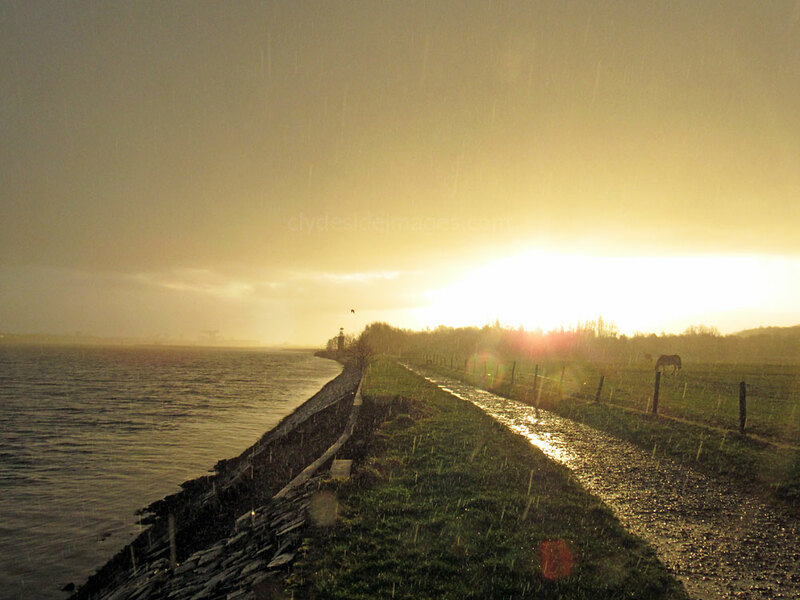 Shortly after first light on Wednesday 16 January 2018, I was cycling along the Riverside Walkway at Erskine when Scot Venture​ sailed into view during a heavy downpour. 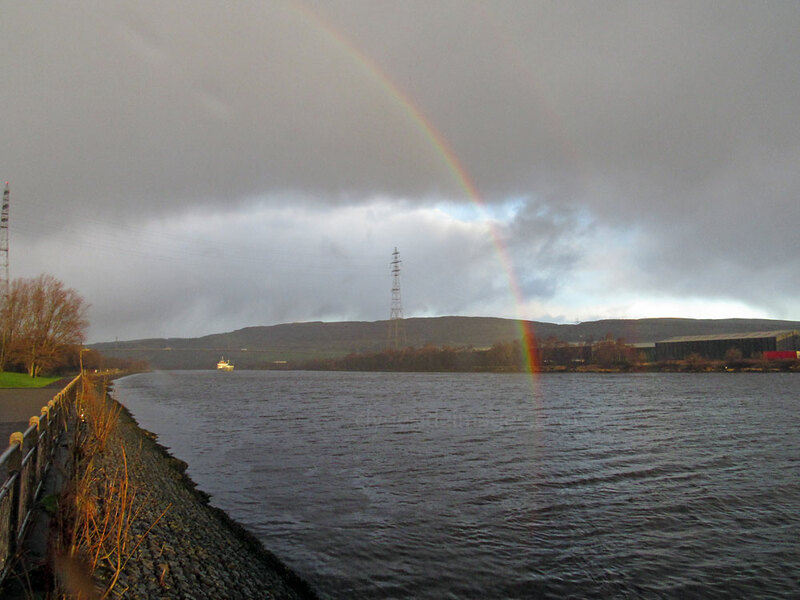 It was a very stormy scene looking towards Glasgow but there was a nice rainbow in the opposite direction. The rain meant unavoidable droplets on the lens though. 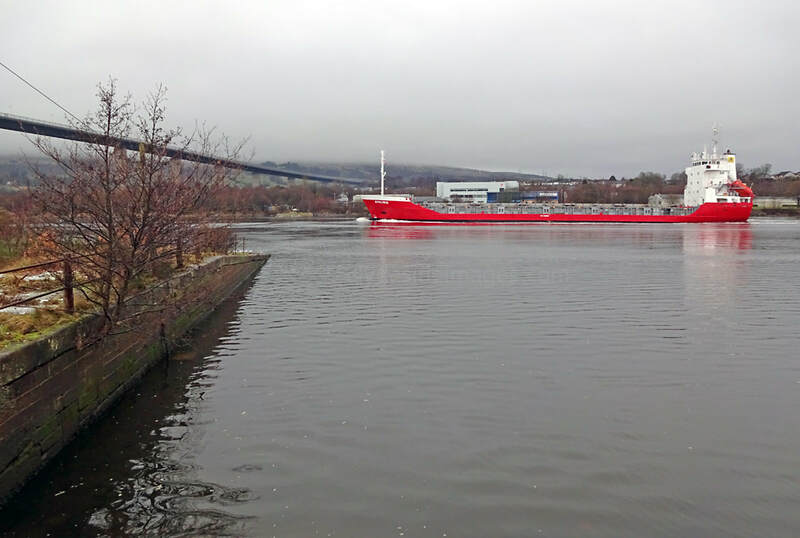 The British-flagged vessel, like the rest of the Scotline fleet, is based at Inverness. 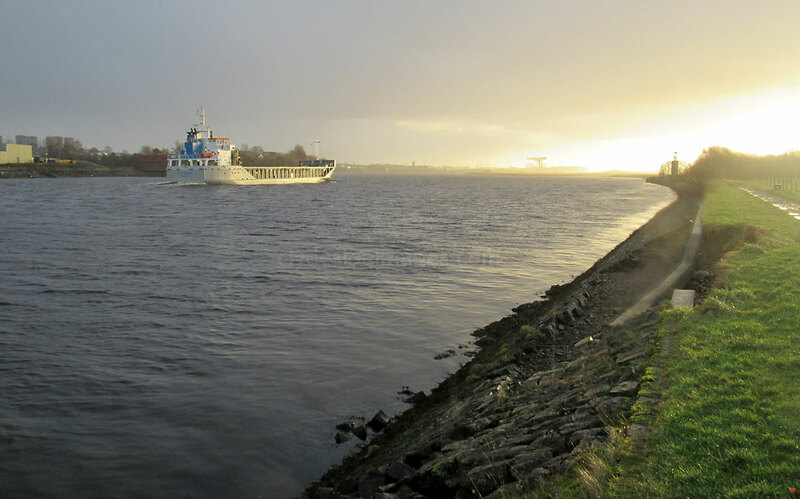 She`d sailed from the Port of Hamburg. 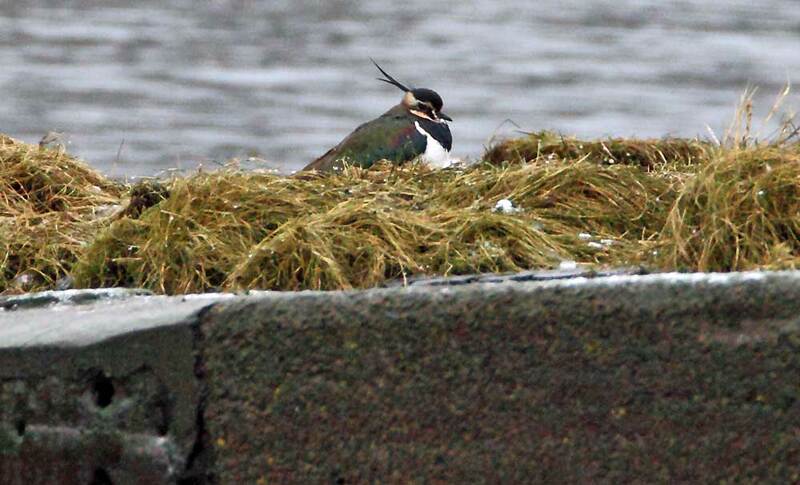 The water level was fairly high, although the tide had started to recede and there were scattered, small groups of Mallard and Wigeon all along the river close to the south bank. 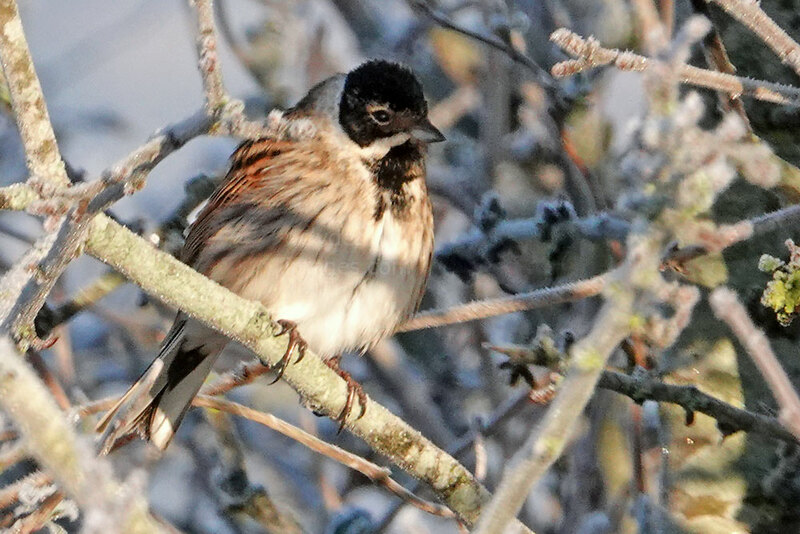 Further west, in front of the Mar Hall Hotel golf course, flocks of Lapwing and Redshank were roosting along the waters edge with Oystercatchers feeding on a small strip of exposed sand. The mild temperatures had fooled the gorse into blooming early with numerous yellow flowers making a spring-like scene.